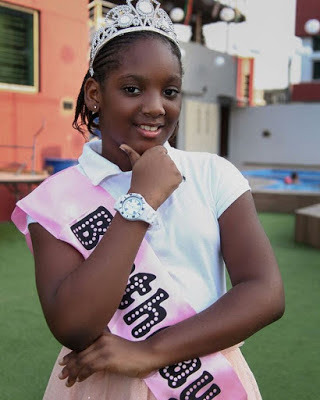 Proud mum, Annie Idibia took to her IG page to share this emotional message to celebrate her daughter, Isabel's 8th birthday. "Thinking about Isabel makes me wanna cry sometimes... my Sunshine.. had her on the last week of the 7th month of my pregnancy..she was sooooooo tiny,even to hold.... but she grew up to be that RARE child that never ever fell sick even as a baby,she's been very healthy n strong and now even taller n bigger than all her mates,youngest in her class,but very Intelligent. My Good Luck Charm.. This child right here is the most caring and loving child I know.. (not cos she's mine) Yes Angels live amongst us and am soooooo blessed to have one as my child... Happy 8th birthday to my Sunshine Isabel.. I will move the earth 4 u."